The other day, I came across some interesting return on investment numbers from the National Association of Realtors. Based on what I've been seeing, I think these nationally averaged numbers are pretty accurate for my market. The average returns are just that, averages and they take into account everything from Home Depot specials to projects that are well-thought out and executed. 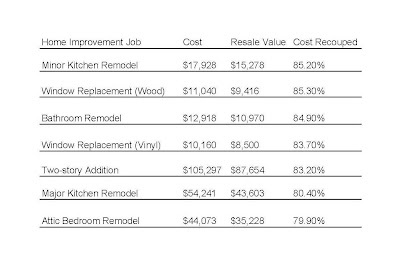 But if the average return on a major kitchen remodel is 81%, maximizing that return would be easy to do. How? You may ask? Why, by hiring me of course. Curb appeal is the impression your home's exterior conveys. It should create an emotional desire to own the home and to live the lifestyle and status it represents, which hopefully continues inside. Curb appeal is what gets the prospective buyer inside to see your new master suite and remodeled kitchen and bath. If most of the homes in your neighborhood don't have a second story and you add one, the neighborhood could drag down the value of your home. If however, you rip out the old kitchen and put in a new one, your home will sell faster and at a better price than comparable homes with the original kitchen. Ask family, friends, co-workers and others you trust for referrals to licensed contractors specializing in the work you need completed. In states that don't license contractors, seek those with strong association ties and proof of insurance. Interview several contractors and don't favor the one with the lowest estimate. [italics mine] "Frequently they don't have enough money to do the job and will leave you hanging," says Salem, Oregon-based Myron E. Ferguson, author of "Build It Right" (Home User Press, $18.95). "Get everything in writing and don't commit to a verbal contract," he added. Willis says the best contractors have lots of solid work they are willing to show you and homeowners who have had quality remodeling jobs often have no qualms sharing success. "For really fine finish work, you just about have to go see something else that this person has done. Fine craftsmen always have some clients willing to show off their kitchens. If they don't they are just putting up smoke and mirrors," Willis said. 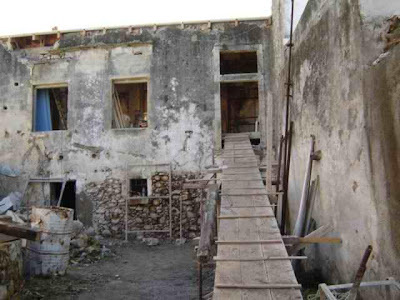 If you're thinking about undertaking a renovation project of your own, now's an opportune time. Look around and just think, there's enough time left to get your kitchen renovated by Christmas.